Thinking of starting a Website to publish your thoughts or promote your business? While you can create “a site in just minutes – No HTML necessary!”, knowing the basics of the Web’s markup language and how it provides information to search robots about your site, influencing your site’s ranking, will give you an edge in building your online business. Reflections on the NY TImes article: A.P. 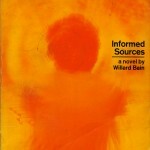 Cracks Down on Unpaid Use of Articles on Web and Informed Sources , by Willard S. Bain, a revolutionary, hallucinogenic novel about the AP written in the late 1960s.